Shipboard electrical system design and development requirements are fundamentally different from utility-based power generation and distribution requirements. Electrical engineers who are engaged in shipbuilding must understand various design elements to build both safe and energy-efficient power distribution systems. This book covers all the relevant technologies and regulations for building shipboard power systems, which include commercial ships, naval ships, offshore floating platforms, and offshore support vessels. In recent years, offshore floating platforms have been frequently discussed in exploring deep-water resources such as oil, gas, and wind energy. 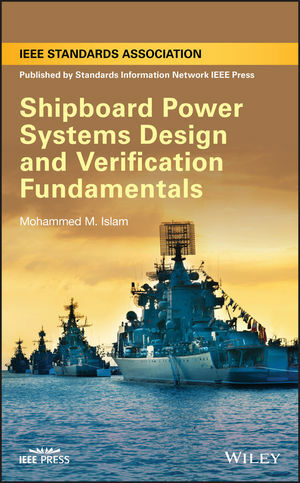 This book presents step-by-step shipboard electrical system design and verification fundamentals and provides information on individual electrical devices and practical design examples, along with ample illustrations to back them. This book is an important read for all electrical system engineers working for shipbuilders and shipbuilding subcontractors, as well as for power engineers in general. Mohammed M. Islam (Moni) was R&D Supervisor of Applied Science at Northrop Grumman Ship Systems, served as the IEEE-45 central committee Chair, and was a member of the IEEE 1580 working group. He has forty-three years of diversified shipboard electrical engineering experience and has played significant roles in every part of new shipbuilding and ship modernization engineering. He provides electrical engineering subject matter expert services, specializing in interpretation of rules and regulations.